Europe clinched the 35th Ryder Cup by an historic 18½-9½ margin after fending off a formidable American charge in the singles at Oakland Hills on Sunday. Bernhard Langer's side began the day leading 11-5 and needed three-and-a-half points to win outright. Though they were hit by an early USA onslaught, Europe responded superbly to eventually win the singles 7½-4½. Sergio Garcia, Darren Clarke and Lee Westwood paved the way for Colin Montgomerie to hole the winning putt. Europe have now won four of the last five of the biennial matches against the United States and handed the USA their heaviest defeat in the competition's 77-year history. The previous biggest margin for Europe was 16½-11 in 1985, though America hold the outright Ryder Cup record with a 23½-8½ victory over Great Britain and Ireland in 1967. Victorious European captain Bernhard Langer said their triumph at Oakland Hills capped "a tremendous week". "We had so much fun as a team," he said. "I'm so proud of the guys. We were down early and came back strong. They have a lot of heart." His counterpart Hal Sutton admitted his USA team had lost to the better side. "The Europeans are great, they came in here and played ferociously, and they holed the putts when they needed to. We just got outplayed." The stage was set for the 41-year-old Montgomerie after Spain's Garcia beat world number four Phil Mickelson 3&2, Northern Ireland's Clarke secured a half against Davis Love and England's Westwood beat Kenny Perry by one hole. 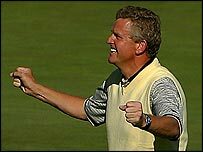 Montgomerie, a seven-time Cup veteran, has struggled since winning the last of his seven European titles in 1999, and has suffered the breakdown of his marriage in the last few years. 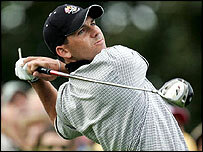 But the Scot, who needed a wildcard to make the team, continued his imperious Cup form from The Belfry in 2002. And he stretched his singles record to seven wins out of seven with victory by one hole over former USPGA champion David Toms. 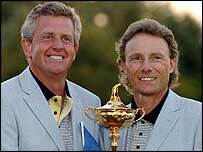 "It's been a fantastic week," said Montgomerie. "Bernhard Langer has been a wonderful captain, but he had great troops playing for him. Personally it means nothing. It's all about a team event. "We are one of the closest-knit teams in international sport. It's amazing how we play for each other." The margin of victory, though, belied the effort needed from the whole 12-man team on the final day. US captain Hal Sutton sent out his side in the order they had qualified and America's number one Tiger Woods set the ball rolling, never trailing to English rookie Paul Casey before winning 3&2. Former US Open champion Jim Furyk then humbled England's David Howell 6&4 as the scoreboard took on a distinctly red hue, indicating the number of matches America were up in. But gradually Europe fought back, inspired by the talismanic Garcia in match two. 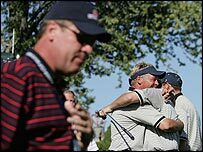 After the Cup had been won, rookies Ian Poulter, of England, and Frenchman Thomas Levet picked up their first points against Chris Riley and Fred Funk. Irishman Paul McGinley, who holed the winning putt for Europe two years ago, then beat Stewart Cink 3&2 and countryman Padraig Harrington edged out Jay Haas in the final game.